Solemn Strike is one of the best trap cards in the game, and everyone knows it. 1500LP is nothing to pay to stop a Special Summon or monster effect. The added coverage against Special Summons, being a Counter Trap, and the destruction ability it has gives it a distinct advantage over Breakthrough Skill and Fiendish Chain. While those cards have positives of their own, Solemn Strike is in a class above. Very few times in a game is this card a dead card, every deck can use this card, and in multiples. What can be said about Solemn Strike that hasn’t already been said? 1500 Life Points to ruin someone’s entire turn is probably why it will get limited someday. Counter Traps are great. It is susceptible to back row destruction, but the pros outway the cons. Every deck summons at least one monster. People say that 3 isn’t necessary, but run 2 with Warning in the main and the 3rd in the side. Score: 4.5/5 Judgment is better. Everyone and their mother at this point knows about Solemn Strike. I’m sure most decks play it as well. It is just now that it got a budget reprint so more players can access it. Solemn Strike is simple, pay 1500 LP to negate the Special Summon (only inherent summons, Solemn Warning stops effects to summon monsters) of a monster or the effect of a monster, and destroy said monster. I can’t think of a Solemn card that is even bad. 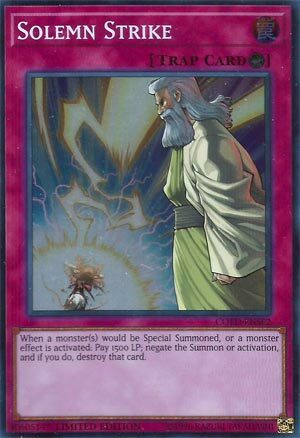 Solemn Judgment is banned currently because of its power, though I will argue that it is fine at one. Solemn Warning is limited because of it being basically a staple. Even Solmen Scolding has its spot in the game. Solemn Strike is one of the better legal Solemn cards right now, and you are most likely going to see it when you are in a duel, whether you are playing it or your opponent is. The card is just that good. Oh look, another Solemn card. Solemn Strike is up for review today, and this is a good card. This costs slightly less than Warning (1500 instead of 2000) and is slightly less versatile (as Warning can negate Magic and Trap cards) but you still have the openness here as to the Monster you destroy can be Normal or Special Summoned, which is good. Of course, this is worded tentatively, as IF you do, you destroy the card. Sometimes you do get in these spots and pay those Lifepoints all for naught. While not bad, I’d still with Warning. Although recall, Warning is Limited, and you can use two of these, if you so wish.